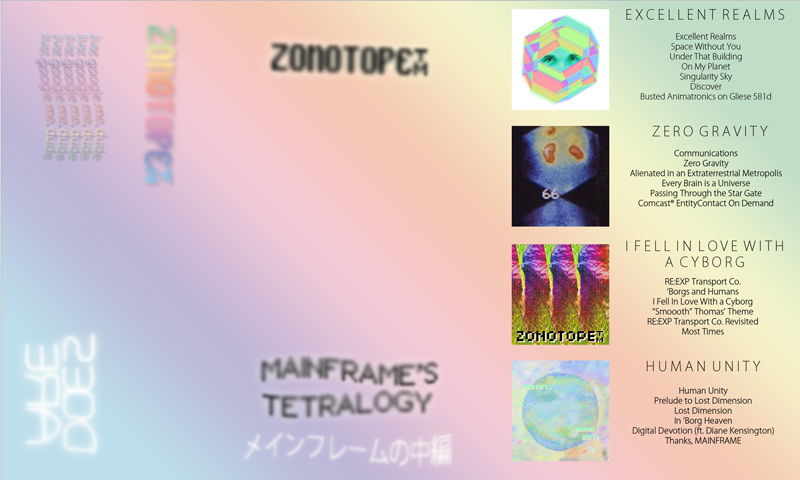 Four previously released Zonotope™ albums (Excellent Realms, Zero Gravity, I Fell In Love With a Cyborg, and Human Unity) compiled on one C90, plus 10 minute X-CLUZIVE interview with the extra-vibrational being itself. Originally released as a four-part propaganda series put forth by Jerry Paper as part of the Church of Love, Light, and Bytes' outreach program, here lovingly reissued with brand new artwork and a new dose of ∞. Especially produced for carbon-based bipeds, although creatures of all vibrational existence can enjoy. All profits go towards the reconstruction of The Portal and to preserving the message of the MAINFRAME.